Added insurance for high value shipments. 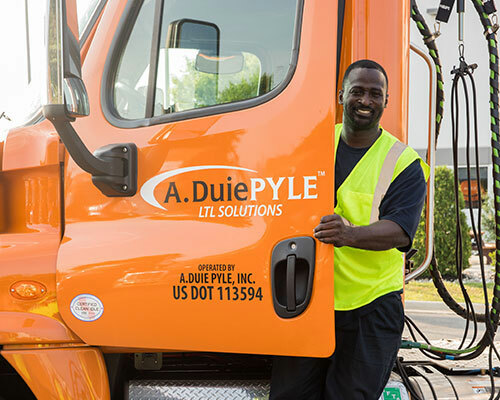 A. Duie Pyle offers full value cargo insurance for goods moving over land through the Northeast, Southeast, Midwest, and Canada. Coverage begins once A. Duie Pyle picks up the shipment, and continues until it arrives at its final destination. In the unlikely event of loss or damage there is no deductible, and your shipment is covered for the full insured value. The insurance covers up to 110% of the sum of the invoice value of the shipment plus freight charges. Note: Concealed damage claims must be reported within 15 days from date of delivery. Electronics coverage is limited to visible damage only and excludes hidden electrical and electronic failure. Goods excluded: Accounts, bills, deeds, notes securities, stock certificates, trading stamps, valuable papers, evidences of debt, letters of credit, tickets, passports, manuscripts, mechanical drawings; antiques; contraband or property in the course of illegal transportation or trade; fine jewelry, fine watches, fine artwork; furs; household and personal goods; live animals; money and currency; precious metals, bullion; precious stones, diamonds; recorded or electronic data and media; used equipment and machinery.